Yesterday, there was a huge update in Slackware current regarding Xorg packages and its components. It took me an overnight download to sync the Slackware current tree in my machine and applied updates in the morning. Great results so far. After upgrading everything from the Slackware current, I immediately started X and launched Firefox. I have read few stories that X is better in this release. Some says that they have better 3D acceleration sort of. I launched Firefox and visited LinuxQuestions.org forum but actually I’m just playing around. 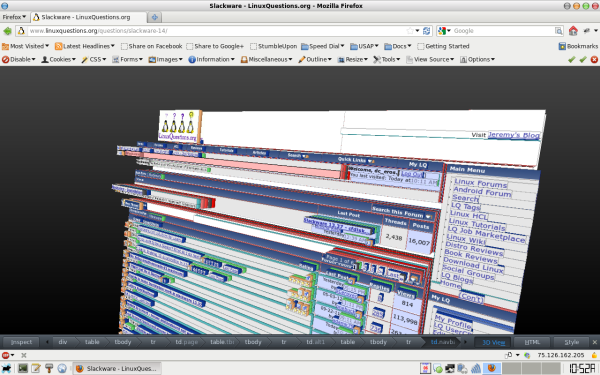 I remember that Firefox has this cool feature that allows visualization of HTML elements in 3D view. This feature was not working before I updated. This time, when I tried it, it works. See image below. This entry was posted in Linux, Slackware and tagged 3d, 3d view, firefox, slackware current, slackware current update, x, x update, xorg. Bookmark the permalink.